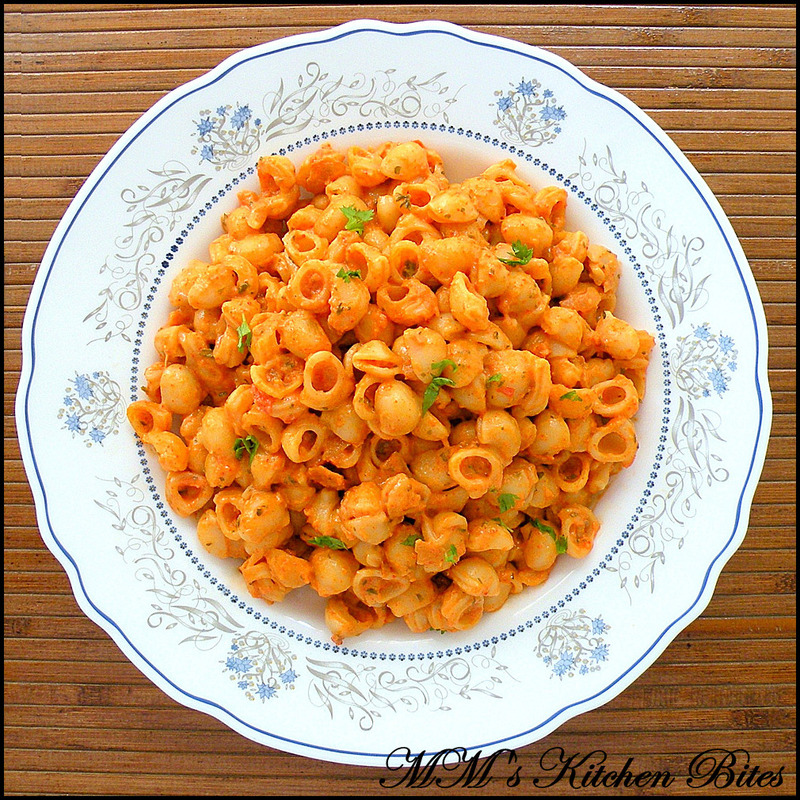 MM's Kitchen Bites: Creamy Roasted Red Pepper Pasta...shutting out the world!! Creamy Roasted Red Pepper Pasta...shutting out the world!! Roast the red pepper in a 220C oven until the skin is black and blistered. Remove and place pepper in a paper bag or cover with kitchen towel. Once the pepper is cool enough to handle and the steam created by the paper bag/kitchen towel has loosened the skin, peel it, remove seeds and chop. Cook pasta according to package instruction / al dente. Take out about ¼ cup of pasta water and keep aside. Drain the pasta. While the pasta is cooking, start with the sauce. In a pan over low heat, sauté garlic and onions in olive oil till soft. Add in the red pepper, tomato and cook for 3-4 minutes. Switch off the heat and blend the red pepper mix into a slightly coarse puree in a blender/food processor. 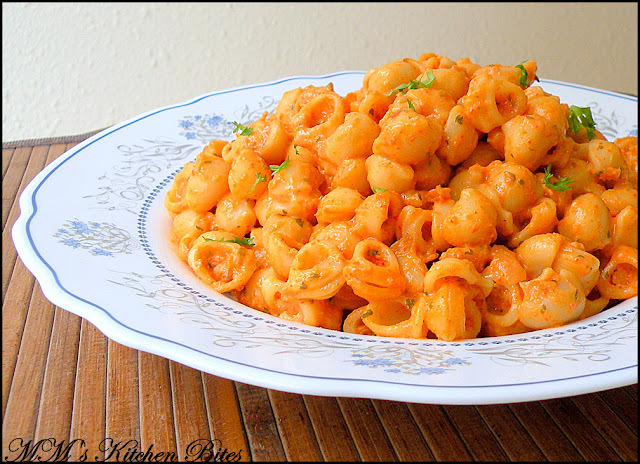 Heat butter in the same pan and tip in the red pepper puree. Add in the reserved pasta water, dried parsley, salt and pepper. Let the sauce heat up and then add in the cream. Toss so that the sauce coats the pasta, check for seasoning and done!! Serve sprinkled with a little fresh parsley on top. One of my most favorite flavors in the fall is that of roasted sweet bell peppers. I buy them in bulk and roast them out on the grill. Definitely love this recipe and can't wait to try it!